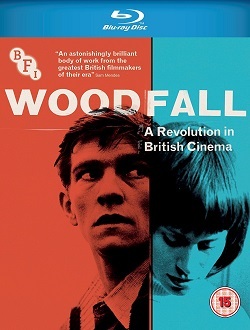 When the British Film Institute released the first eight feature films from the groundbreaking British studio Woodfall in a Blu-ray and DVD box set in June 2018, that was not all contained on them, as there was included a wealth of special features. These included featurettes, audio commentaries and interviews, an informative booklet (from where much of the following info is gleaned) plus a large amount of vintage material, and among that were a selection of short films as part of, and in the spirit of, the Free Cinema movement of the nineteen-fifties, and into the sixties. Here we take a closer look at those brief glimpses of British life. First, on the Look Back in Anger disc, is 1963's Ten Bob in Winter, notable as one of the early pioneers of British black cinema for it was the brainchild of Lloyd Reckord, who with his brother Barry Reckord had made waves in the theatre world of the fifties and onwards. He narrated this tale of class within the Jamaican expats in London, as his protagonist finds himself reduced to borrowing the ten bob note of the title, then losing it when lends it to someone lower class than himself, then embarrassed when he meets a higher class friend outside the pawnbrokers he is hoping to get the note back from. Just ten minutes or so, this was light and airy despite the chilly conditions, almost humorous but pulling back from actual jokes in favour of a realism that worked in its favour as a depiction of London life even now you don't often see. 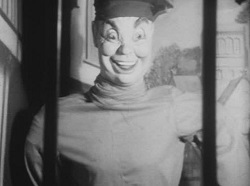 Class was also a subject of O Dreamland, one of Lindsay Anderson's contributions to the Free Cinema movement from 1953. It was captured on a trip to Margate and looked forward not so much to his defining sixties classic If..., but more to his controversial eighties scattershot satire Britannia Hospital, where the great British seaside holiday was held up as a grotesquerie of cheap, seedy entertainment, artery-hardening fast food, and a general air of people enjoying themselves not merely because they've been told this is amusing, but also because they don't know any better; not that Anderson appears to blame them for their delusion. With its chambers of horrors, the mocking laughter of Jolly Jack Tar machines, bingo that pays out less than you put in, the air was of a scabrous takedown of a romanticism in popular diversions that contained no such thing. That was on The Entertainer disc, as were a collection of shorts from Mitchell and Kenyon, those pioneers of British cinema who set up the then-newfangled moving picture as a source of great novelty in their sideshows, inadvertently capturing a time capsule of the early Edwardian era. We can look back and see these members of the public, each of them long gone, and muse over their lives and what brought them to Morecambe, which is where these clips are from. Most of them seem happy to be there, waving, grinning and mugging at the camera much as you will witness in the background of a modern news report, though watch out for the odd black look right down the lens. Also included was a newsreel story from 1929 featuring a busy parade in the town. 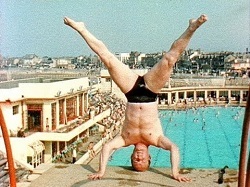 Morecambe in Lancashire was where The Entertainer was set, and a more benevolent view of the place was offered in contrast to O Dreamland's Margate with 1957's 15 minute Lancashire Coast, a tourist's eye view of holidaymaking in the region's coastal resorts, from Blackpool to Southport and more. Morecambe was mentioned with regard to its beauty contest, something that shows up in the Laurence Olivier drama, but the attractions ranged from densely-packed beaches to lonely sands, depending on your tolerance for your fellow human. Hubert Gregg, he of the long running radio show and songwriting fame, was our narrator, and adopted a swooning romanticism at times, more humour at others - Arthur Askey appeared on the golf links, advertising his theatre engagement. On the Saturday Night and Sunday Morning disc, the short film featured is a fairly lengthy one, We are the Lambeth Boys, an authentic example of Free Cinema from 1959 which took a look at a youth club in that district and attempted to build a well-rounded account of what it was like to be a teenager when the media and the pulpits were decrying them for being a bunch of tearaways, or even thugs. To an extent, director Karel Reisz, about to be a name in the British New Wave, succeeded, and there was plenty of footage of the kids (who look like fiftysomethings to modern eyes) hanging around and not being particularly offensive (unless you were one of the passersby they yelled at on a truck journey from a cricket match, one supposes). The most interesting parts allowed them to simply talk, but the voiceover and general, trendy social worker enthusiasm marked it out as a product of its decade, more than you assume the makers intended. The A Taste of Honey disc carries the British Transport Films 1957 favourite Holiday, one of a number of short films preoccupied with what the Brits got up to in their vacation and leisure times, and one of a number in this set. With a couple of bursts of voiceover (from Robert Shaw), in the main this was clip after clip of folks enjoying themselves, at the beach, on the seafront, at the pool and through the famous illuminations at Blackpool once night fell. All arranged with military precision and in powerful colour, it had a go at conveying the sheer relief at getting away from it all and to a certain extent succeeded, a seventeen-minute barrage of celebrating the art of the holiday, all scored to the sound of Chris Barber's jazz band covering a selection of trad tunes. If nothing else, it gave you the impression of why such breaks were so important. The Loneliness of the Long Distance Runner disc has the short Momma Don't Allow, which marked, more or less, the beginning of the Free Cinema style thanks to its direction from Tony Richardson and Karel Reisz who collaborated to bring us this evening at the Wood Green Jazz Club where The Chris Barber Jazz Band in 1954 were performing (this was released two years after). The trad jazz sound was very important to those fifties filmmakers, and was showing up as a happening slab of pop culture as late as the mid-sixties in cinema, so this was a vital recording of its earlier impact, with a casual narrative about leaving work for the club, a class tension between the fun-seeking dancers, and a brief falling out between a young couple, to offer a little visual interest and offset the tunes. Richardson, thus inspired, would go on to found Woodfall with playwright John Osborne. There are no short films on either of the Tom Jones discs (original and director's cut), but Girl with Green Eyes had two, starting with Food for a Blluuusssshhhhh, a nonsensical title for a nonsensical item. If this looked like a student film, that's because it was, the students in question Elizabeth Russell (our director and star) and Nicholas Ferguson (actor), who toiled over two years to get this half hour piece completed. Like a lot of surrealist artworks, it means so much to the creators that you will be baffled if you try to work it out - they were inspired by the original surrealists, but it was impressive for such a low budget enterprise for its use of locations and flighty nature, never settling on one concept for too long, be that Nero fiddling while a cardboard Rome burns, or the comical callousness of a filmmaker following his muse at the expense of the woman he is supposed to love. This was brought under the Free Cinema banner by Anderson and Reisz. The second was The Peaches, a sixteen-minute fable from TV director Michael Gill and his wife Yvonne Gillan which set out to tell the whimsical tale of a "beautiful girl" who everyone loved, and her wrestling under this blessed concept which becomes more a ball and chain than the liberation she would prefer. Indeed, as young women were growing more liberated than ever before at this point (1964), the girl was emblematic of the sort who could be independent and know her own mind without a man needing to tell her what path her life should take - her only concession to indulgence is her passion for the titular peaches, shot with sensual technique by Walter Lassally, who was having a great decade and often turned up in the credits of material like this. The central character was played by Juliet Harmer, who was later famed as the colleague of TV's Adam Adamant. The Knack …and how to get it has one short to end on, Captain Busby: The Even Tenour of Her Ways, and as mentioned above appears to be one of those surrealist manifestations of a stream of consciousness that would doubtless mean an awful lot to its creator, but if you can work out what is going on then you would probably be Philip O'Connor, the writer of the poem it was based on. He was an English eccentric, friend of Quentin Crisp, who shows up with O'Connor here as a station master, though the film was directed by Ann Wolff. Like some British sixties psychedelia there was a Victorian flavour to this, but what Captain Busby was trying to get out of life by sucking his beard or wrestling with a mannequin, or later, what the woman whose "even tenour" was broken (repeatedly, it seems) was so enraged/amused about is anyone's guess. One of the strangest shorts of the sixties, and a neat place to finish the set. The Knack ...and how to get it (Richard Lester, 1965).